This compact RGB LED strip controller allows mixing three individual colors of an RGB LED strip (red, green, blue) so you can adjust the RGB LEDs in all possible colors. 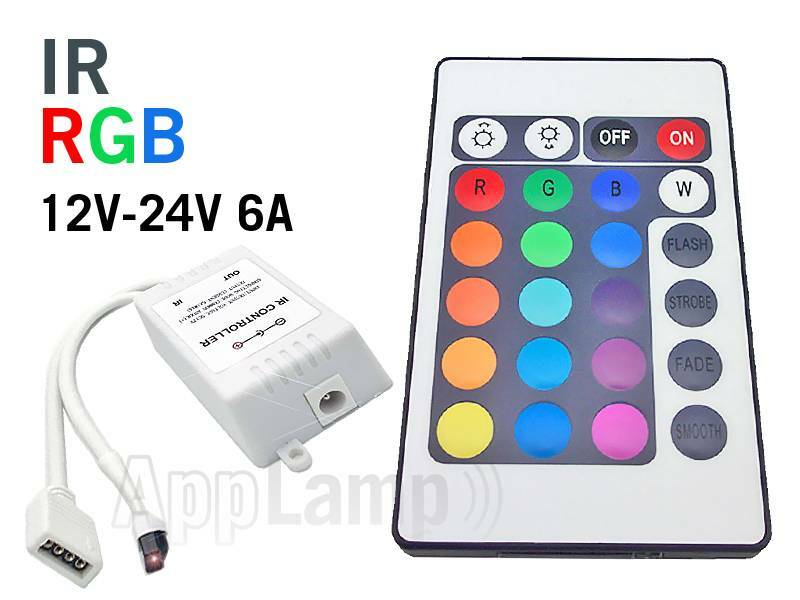 You can connect a standard 12 or 24 volt RGB LED strip to the controller with the universal 4-pin connector and a standard 12 to 24 volt DC adapter via the DC jack plug input. You can use this controller for a 5-meter roll of 300 LEDs or a capacity of 6 amps without problems. - STROBE, white or off. - FADE, soft transitions between colors. - SMOOTH, faster transitions through the colors. 24 KEY IR remote control and RGB controller. You must use an RGB LED strip with this controller (see below). 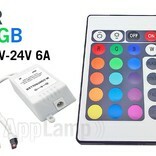 An adapter of 12 volts / 6 amps suitable for our brightest RGB LED strip with 300 LEDs (see below).